Some shy kids pick up a book, others a pen or a musical instrument. 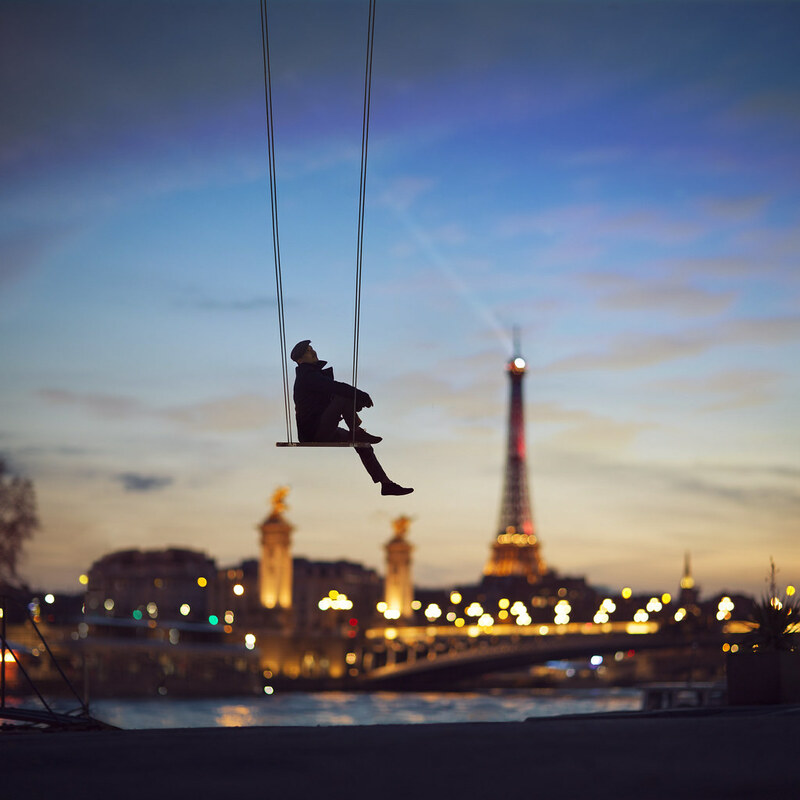 Vincent Bourilhon picked up the family’s one camera at the age of 18 and finally started to find his voice. 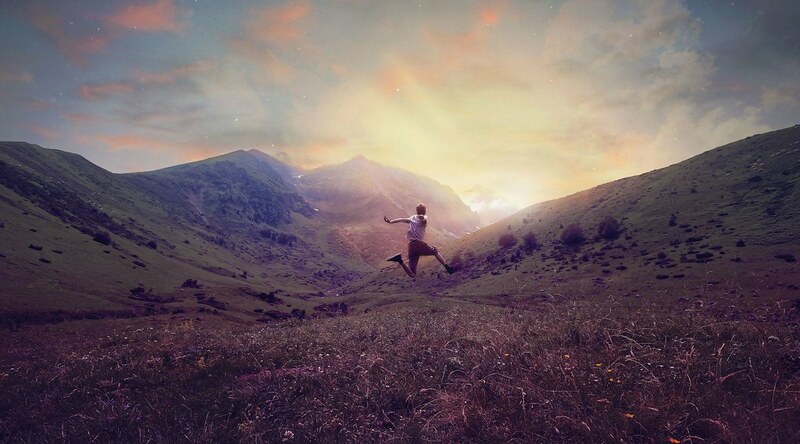 Five years later he is one of Flickr’s fastest growing and most whimsical photographers. He even had one of his photos break into Flickr’s Top 25 Photos of 2015. Growing up shy and reserved, it was difficult for Vincent to express the fantasies he imagined in his mind. 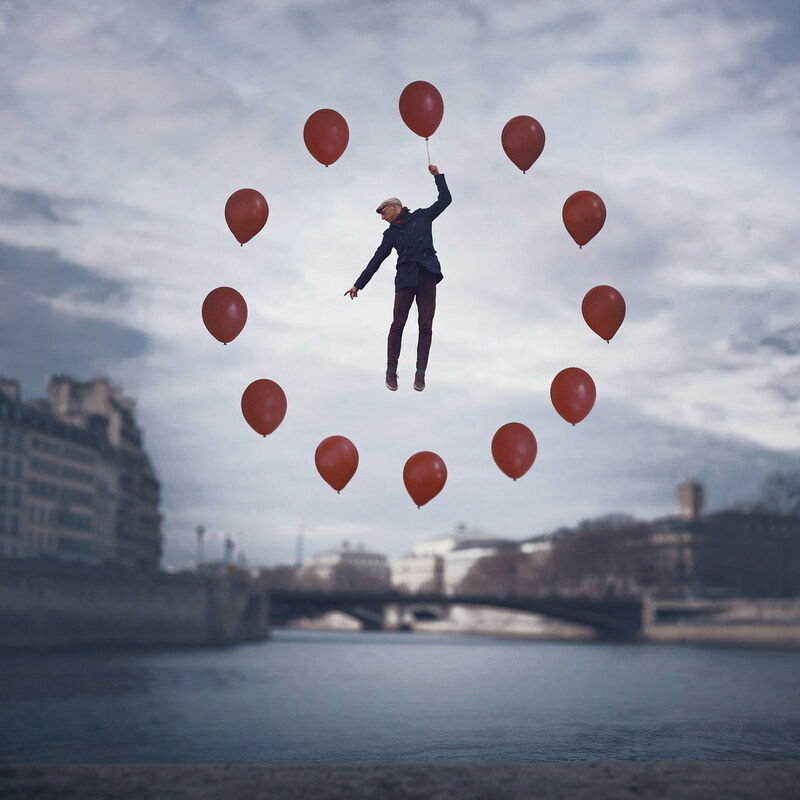 Gradually, as he learned various photo techniques and became proficient with retouching software, his work became more surreal. 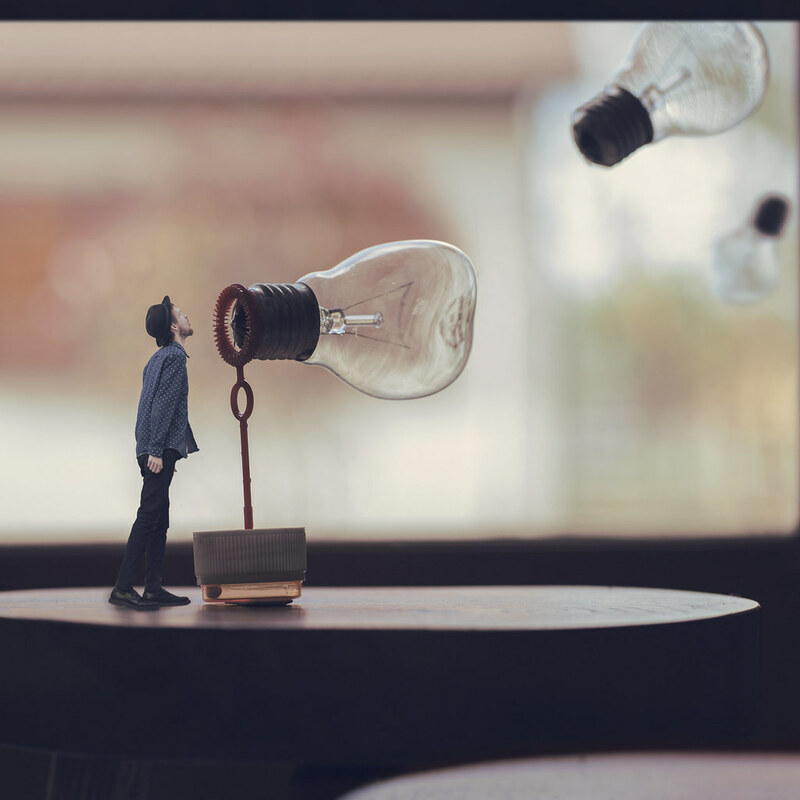 Blow Your Idea is an example of how Vincent merges realistic images into surreal tableaus. Ideas are like light bulbs. Light bulbs are kind of shaped like soap bubbles. It’s easy to have ideas. With inspiration, you can turn your ideas into surreal-ities. Vincent is based in Paris, where he draws much of his inspiration. His work echoes his youthful, fine-art spirit, with the city or French countryside as backdrop. With a relatively simple setup – a manually-focused camera and tripod – he pulls together spectacular shots. The Way For Paris is a perfect example of how Vincent intertwines photography and photomontage. In all, it took 14 hours to pull together on a cold, gray, boring afternoon in Paris. Sitting in his rented room, Vincent decided to whip out his camera and make magic. To blur the background with the Eiffel Tower, Vincent set a self-timer and focused on the gutter of his roof. After many attempts pouring water from a water bottle, he got a shot that dripped just right. 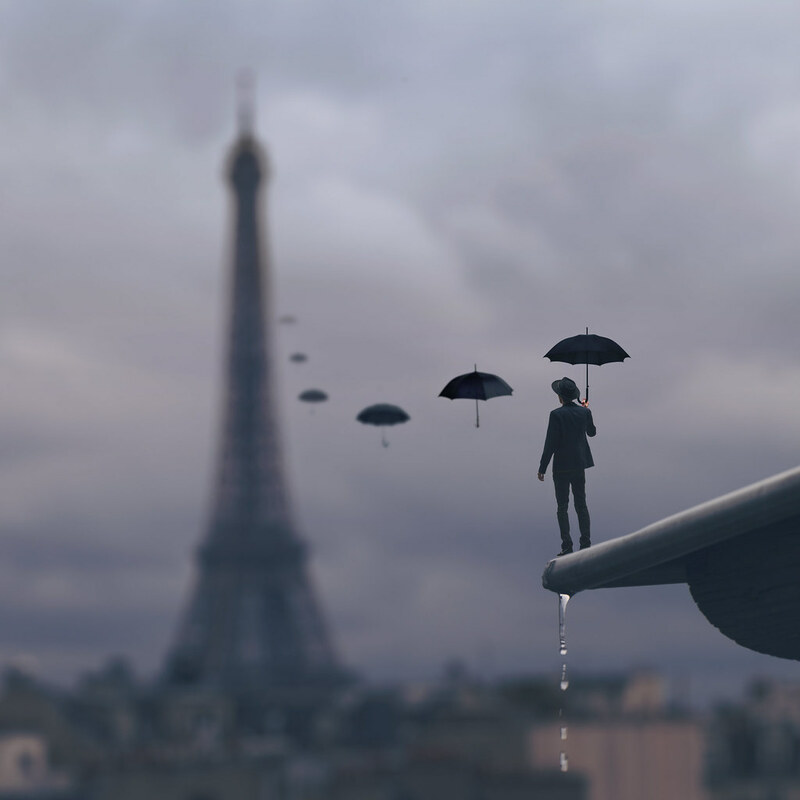 Needing a way to take the image to the next, surreal level, he went down to the street to take a photo with an umbrella. With several more shots of the umbrella, he was ready to merge them together in a Mary Poppins-esque visual. Many of Vincent’s photos have captured the attention of large companies and agencies. At 23, he is a sought-after conceptual photographer with a busy schedule and a growing name for his commercial photography. “Do what you love, it matters little how that is defined [by others],” he explained of his success. Explore Vincent’s Photostream for more of his work and connect with him there. You can also find more of his photography on Facebook and on his website. Barry Talis is relatively new to the street photography scene but his Flirckr following is growing quickly and it’s easy to see why. For today, June 29, we’re celebrating National Camera Day and the tools of our craft.